Now we are rockin’ and rollin’ toward our next runDisney race! You’ve decided on a race, got registered, and have a training plan in place to make all your running dreams come true. So, what’s next? Well, unless you are lucky enough to be Mickey’s neighbor, a runDisney event is usually coupled with a race-cation! This means it’s time to sit down and get planning! First, a shout out to all the vacation planners out there! I know a lot of people use vacation planners/travel agents when planning their trips. I know a lot of travel planners who have helped me get tickets and vacation packages myself. 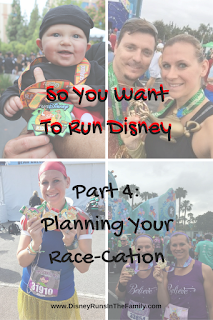 There are more and more sprouting up, too, that know a ton about planning a Disney vacation during a race weekend. If that is how you choose to go, by all means, find one you are comfortable with and let them take the “stress” of planning out of your hands! That being said, I LOVE planning my Disney vacations! It’s not stressful to me at all! I really think planning itself is half the fun. My parents trained me well; they were expert Disney travelers and taught me everything I needed to know. I’m going to try and break it down into steps to be sure you cover all your bases. There are some big differences between the World and the Land, but I’ll try to keep it brief. This blog post will also serve as an introduction to many, many more we have planned on race-cations: hotel reviews, restaurant reviews, etc. Enjoy, and feel free to ask questions! I’m sure I’ve missed something along the way! Step One: Set your budget. Is this going to be your one big vacation for the year or just a long weekend? Many times the budget makes that decision for you. Keep in mind you will want to set aside some extra cash for spending at the expo, in addition to flight, hotel, theme park tickets, food, and souvenirs. Step Two: Set your dates. Check out when the expo opens and how far in advance you want to arrive. I personally choose to put my run at the start of the vacation, and I would recommend that for most people. I do not want a week of park hopping to wreak havoc on my legs before the race. 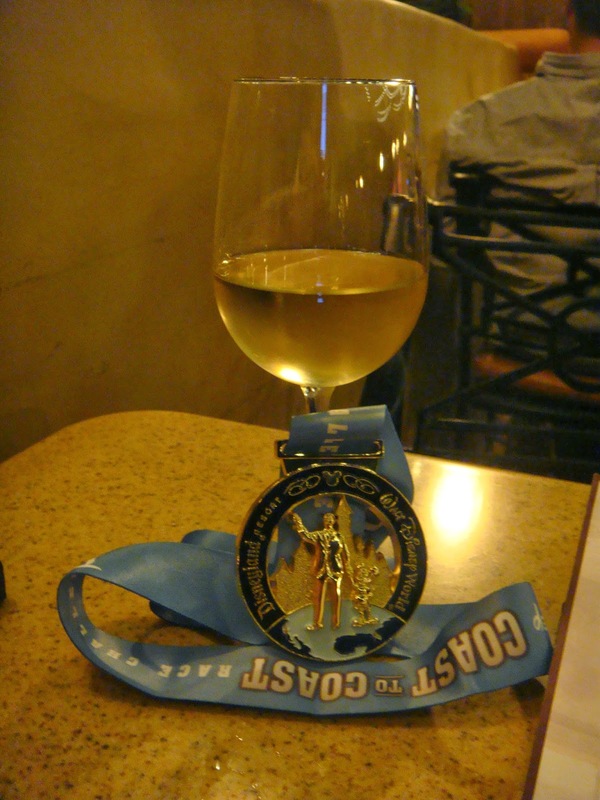 I also love to go to the parks to show off my bling when I’m done, so I have to plan at least one park day post-race. The final consideration is time changes. Whether it's east to west coast or reversed (I've now done both since I lived in Vegas and now live in New York), I sometimes give myself an extra day to adjust. Step Three: Book your flight & hotel. Personally, at Walt Disney World we tend to stay on property while at Disneyland we tend to stay off property. Here at Disney Runs in the Family, we have many reviews of hotels to help you find your perfect fit for your race-cation (and have more to come). Stay tuned! Couple of notes of importance, especially for the World—be sure to check out runDinsey.com for the host hotels and discounts. For the smaller race weekends, you will only get transportation to/from the races from the host hotels. Certain weekends also offer great discounts if you book through runDisney. Disney will require a $200 deposit, but it’s fully refundable if you find a better deal. At the Land, there is something to be said about the whole wake up, roll out of bed, and stroll to the start line just a few strides from your hotel room, though. For flights, we also always try and book direct flights to cut down on travel time. For the World, you’ll want to fly into Orlando. For the Land, either Orange County or LAX will do, but OC is a lot easier to navigate. It just may also mean a higher ticket price, unfortunately. Step Four: Book your tickets. Again, with our on/off property preferences, at the World, we usually package the tickets with the room. Check for discounted tickets for runners. GET Travel is the preferred travel agency for Disneyland, and they offer great discounts during race weekends. For Disneyland, I always recommend the park hopper option. It’s very easy to go from one to the other. Disney World is a little trickier. If you are not planning jam-packed days, a single park ticket might be the best option, as it will save some cash. Also, never forget the option of annual passes. If cost effective, these can be a great option, and you get the benefit of early registration for runDisney events! There are a bunch of different types of passes, so check blackout dates (which often occur during race weekends) and do some runDisney math! Step Six: Book your dining reservations. This is my favorite part! If you are going to the World, you will be able to book dining 180 days in advance. The Land is 60 days in advance. I love to eat at Disney. I love to eat at Disney even more than I love to run at Disney. We are have many food reviews on this blog to get into specific eats we love. For now, just please take advantage of all the great restaurants available. And make reservations early, because you want to have control over your pre- and post-race nutrition even more when you run. The last thing you will want to do the day before your big race is walk from restaurant to restaurant trying to find an available table. Personally, I always plan a table service meal for lunch the day before a half or longer, then keep it light the rest of the evening. This is usually the first meal I plan out. Step Seven: Book your transportation to your hotel. If you are flying, you will have to figure out how to get to Mickey’s house. If you’re at Walt Disney World and you’re staying on property, book your tickets for the Magical Express. They take care of everything!!! They will pick up your bags from the airport for you and transport you to your resort. A few hours later, you bags magically are delivered to your room. The best is it’s all for free with your resort stay. In Disneyland, you’ll have to get more creative. There are many reliable shuttle services that can take you to your resort. We've done the "not so magical" express from Orange County airport (no, that's not REALLY the name, it just isn't quite like WDW), have taken a cab, an Uber, even Super Shuttle. Now that we have Robby, we have to be a little more pre-planned to deal with car seats. Bottom line: unless you have other things in your plans, I personally don’t think you need a car at Disney. Others may disagree, and have valid reasons, but I’d rather let someone else do the driving! And there you go, a perfectly planned race-cation! As you approach race day, there is some more planning, but we’ll leave that for future posts. 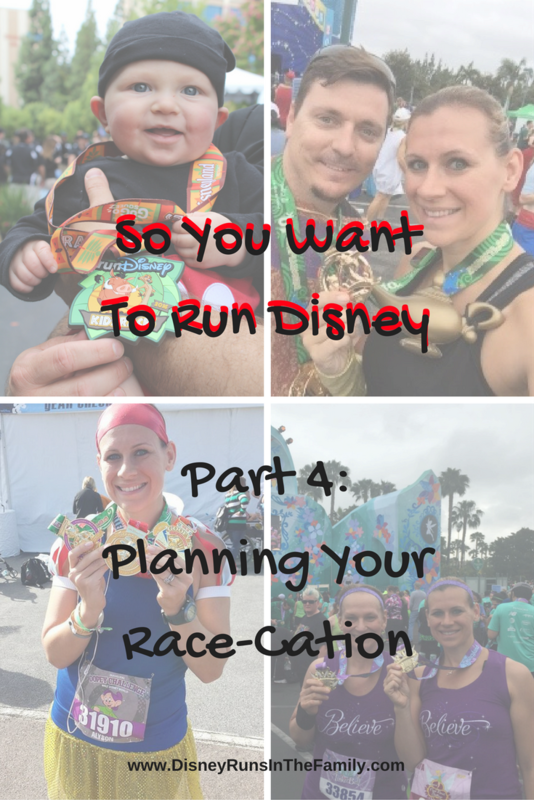 Do all this, keep up with your training, and I guarantee you’ll have an amazing runDisney experience. Did I miss anything? Do you have any other planning tips? Connect with us on Facebook, Twitter, or leave a comment here! We’d love to hear from you!